We receive a lot of phone calls at Fabric Mart and have noticed our customers have the same questions and concerns. 1. Why can’t I order swatches of the fabric offered on the Fabric Mart website? Because we buy relatively small yardages from designers and manufacturers, our fabric sells out very quickly. Therefore, we would not be able to ensure that the fabric you requested would still be available. We try to provide the best description possible of the fabric instead and offer a 100% guarantee if you are not satisfied with the fabric. 2. How is Fabric Mart different from other online stores? We buy overstocks from manufacturers and designers. This allows us to keep costs down on great apparel fabric. 3. Can I add to my order after it is placed? This is discouraged due to how quickly the fabric moves. Adding to your order will delay your processing and may result in items no longer being available. 4. Can I return my fabric? We accept returns on uncut, unwashed fabrics. We have a 30 day return policy and we do not refund shipping. If you wish to return any item, please enclose a copy of your original order in the package for proper credit. 5. What is a mystery bundle? A mystery bundle is a 10-yard assortment of beautiful fabric remnants, many being end-of-bolt pieces from our website. This is a fun and exciting offer! However you do not have the option to choose what color, print, or fabric you will receive. Bundles are not available all the time as we must accumulate remnants to create these bundles. 6. Why does my fabric come in a surprisingly labeled box that does not pertain to Fabric Mart? Fabric Mart uses clean, new, recycled boxes. Not only is this good for the environment, but it allows us to keep our shipping costs low! 7. Sometimes items are removed from my shopping cart before I place my order. Why? Yardage is pulled out of inventory when an order is placed and paid for. Occasionally another customer may buy the last of that item while you are still shopping. We know this can be frustrating, so we recommend finishing your order in one sitting to avoid missing out on the fabrics you selected. The “maybe later” list and your shopping cart will not hold your quantity. 8. Why do “sold outs” occur? We try our best to keep our inventory as accurate as possible. We not only have a website but also a brick and mortar retail store. Our local customers are welcome to shop our website inventory. Sometimes we do not have a chance to update our inventory from store purchases quickly enough. Other factors could include flawed fabric, or fabric that came in small pieces instead of one continuous piece. If you would like to be notified of sold out fabric on your order, please check the toggle on the checkout section. If you still have a question that is not listed here about our online website, placing your order, or a recent purchase, please ask. And if you have a question about a project, feel free to ask the blog team! 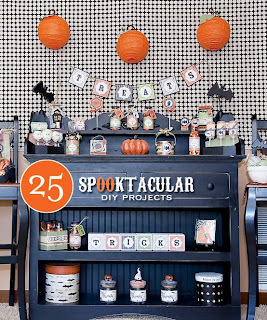 Getting ready for your Halloween and Fall festivities? 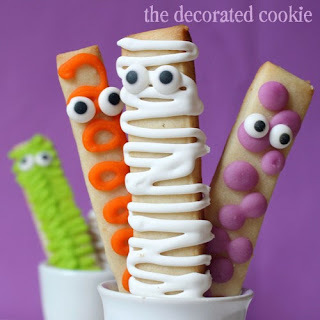 So go get started decorating for your party and look for more inspiration on our Pinterest! 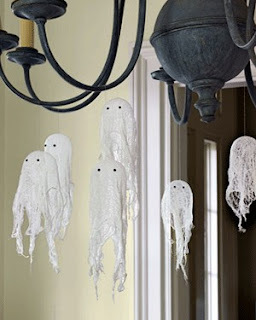 Tags: Costume, Craft, Decorations, Halloween, Inspiration. 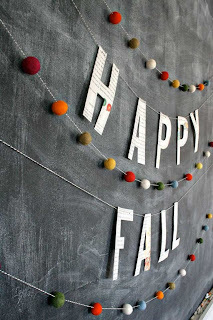 I have something special for you on the blog today! Meet my friend Grace from You by Grace is here to show you some of her favorite trends for this season. I met Grace through Char Photography and loved her personal style from the very first minute. I was thrilled with excitement when I saw that Grace was going to be working with Char as a stylist. 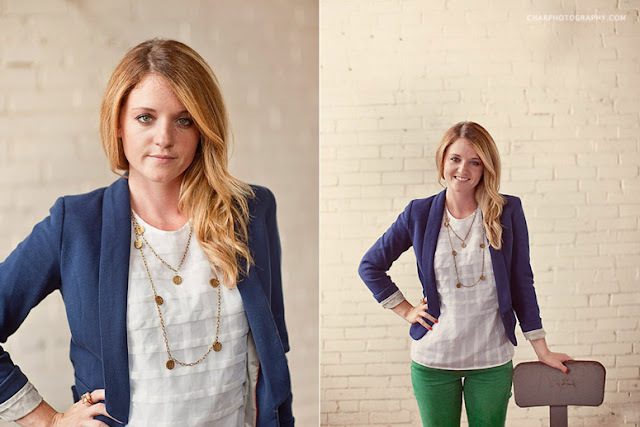 I began following her blog and Pinterest immediately! I highly recommend you do too! Hi, My name is Grace. I am a stylist. I am passionate about creating, fashion, color, art, and beauty. As I tend to follow the the fashion trends, I personally feel that fashion isn’t fashion without putting your own twist to it. Owning what you wear and how you wear it. If it is adding something you love to a “trend” or minimizing the “trend” to make it your own, I feel that is what makes it YOURS. I love originality, and I believe that is what makes true style. I work for a phenomenal Photographer, Char (http://www.charphotography.com), as her stylist. We work with a lot of high school senior girls for their senior portraits. 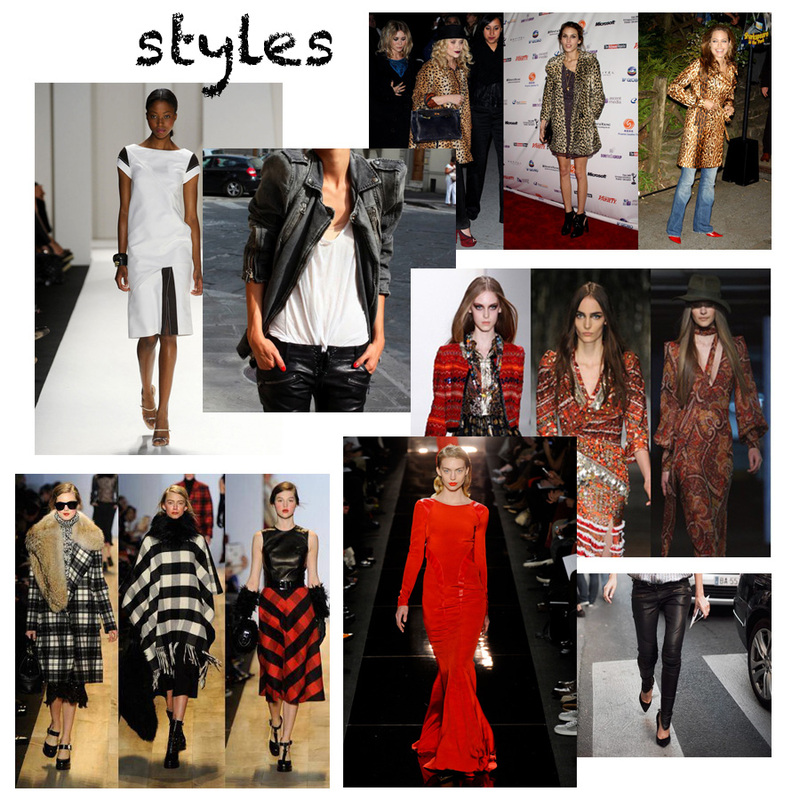 I aid them in finding what to wear, helping them know what is trendy, and where to find those trends. I have found that it is hard for some girls to have a cohesive look. Coming up with inspiration and brainstorming what they are drawn to helps this process. I believe that a look is head to toe, so I help with the hair and makeup as well. It gives our images a finished and cohesive look.This fall while collecting inspiration for my clients and myself I am drawn to so many different trends. First, Shapes! Some of the shapes that I am in love with are oversized outerwear. Anything from sporty knit jackets to boyfriend blazers, to sweaters, just wear it a little oversized and you will be right in with the trend! 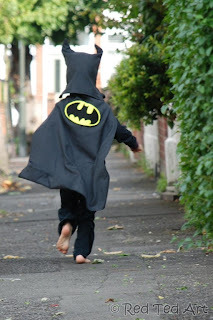 I am noticing a lot of capes as well. Another shape is the Peplum. Surprisingly helpful to most body types in defining the waist and widening the hips. This shapes is widely used in different ways on shirts and skirts. I love every way it is worn. Second, Styles. The list could go on and on, so I will just give you some of my top favorites! This is anything from color to head-to-toe styles. Remember color blocking was in last season, it still can be, with black and white. Bold black and white, tailored, and color blocking, will give you a sophisticated look. Bohemian printed dresses in rich fall colors are always easy and fun paired with a nice jacket. Leather! Anything leather, pants, jackets, skirts, boots, and totes. Animal prints can be worn in any sort of way. Shades of red, especially crimson. Pale grays. Head-to-toe prints. Plaid is still in, I don’t know if it will ever not be in! Nice tailored pants or anything tailored. Simple and Classic. Stripes and polka dots are still around even mixed! White is even being carried over into the cooler season. For fall I love to layer. Mixing different textiles is great for texture and will make simple colors more interesting. Third, Details. Accessories are most of the time what people remember and notice! You want those details to be good. Collars are one of my favorite details for this season. A lot of shirts have them built in or you can wear collars as a necklace. Choose collar shapes that flatters your face. Rounded edges help more angular face shapes and pointy edges help round or softer features. Head scarves are the perfect accessory, mix and match florals with solids. Sequins is a great dramatic accessory, add to anything simple. Big rimmed hats are another go-to to finish off the outfit. Anything that adds or even gives you a statement. I hope that this inspires you to find and create what you love through what is in trends right now! Thank you, Grace! You're wonderful! Anna Sui is one of the most well-known designers in fashion today being named one of the top five fashion icons of the decade. Her timeless designs and wild prints have earned the Lifetime Achievement Award from the CFDA. Like many fashion students Anna Sui began at Parsons. After school she started out by designing clothing out of her apartment. With only $300 in her savings she quit her job and ran a business from a corner in her living room. How many of you are in the same situation right now? Don't give up, you could be just as successful as Anna Sui someday! Find Anna Sui fabric on FabricMartFabrics.com! Below the images are links to the fabric we have that are currently online. Read more about Anna Sui here. Do you have a business, but have a hard time finding the fabric you need? Have no fear, Fabric Mart Wholesale is here! If you are a designer, fabric store or small clothing manufacturer, you need to check out our wholesale website at: www.FabricMartWholesale.com. The wholesale division carries a different selection of fabric than the retail website. If you can purchase 12 or more yards of fabric (12 yards of ONE continuous piece of fabric, or a bolt) and you are a business, email Julie now. She will assist you finding the fabric you need. Our stock constantly changes, so even if we can't help you now, you never know what deal is coming up next! Did you know there are textile trade shows catering to small designers and fabric stores? No need to feel overwhelmed at the huge fabric shows with companys forcing you to purchase 2000 yards or more! 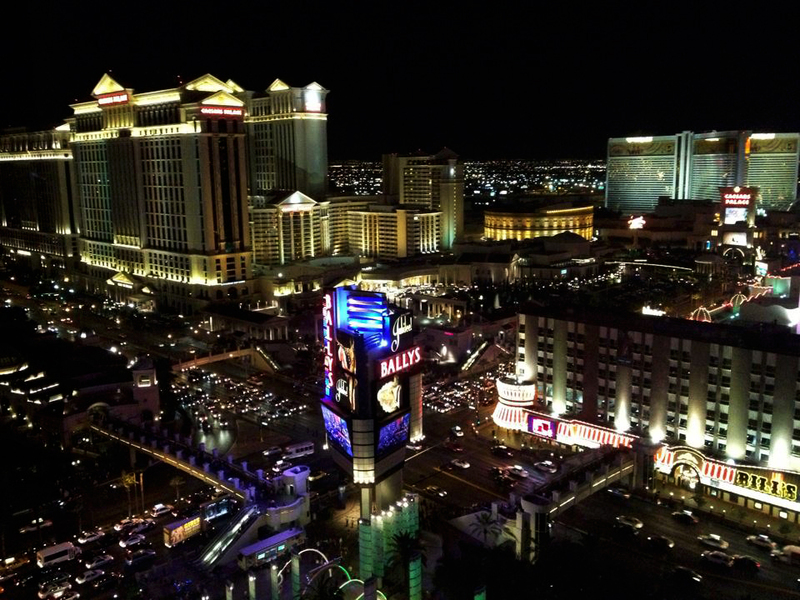 We just came back from the International Textile Expo in Las Vegas. Normally held in March and September, it is a one-stop shop for any small business! There are numerous jobbers from around the country including NYC and LA, quilting cotton companies, sourcing agents, and trim/notion/button companies. We also participate at shows in all over the country. For an updated list of shows we're attending, check out our website: www.fabricmartwholesale.com. Want a sneak preview on available fabrics in the wholesale division? Check out on Facebook page: Fabric Mart Wholesale Facebook. We try to post our newest fabrics as often as possible! 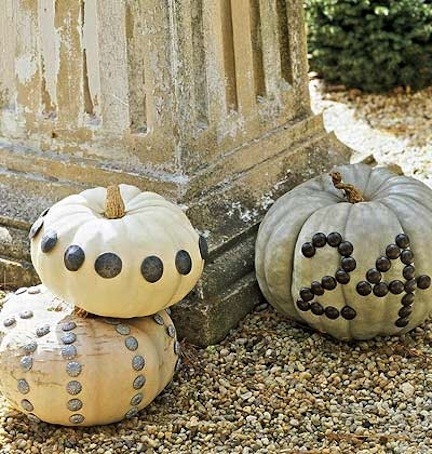 Pumpkin decorating has been taken to new levels in the 21st Century! I'm only 26, but when we decorated pumpkins "back in the day", we either painted them or carved out the basic eyes, nose and mouth. 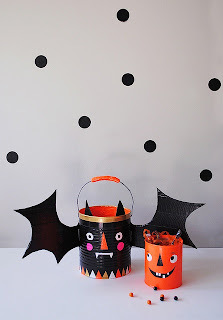 Today there are so many different supplies and fresh ideas, that the traditional pumpkin almost seems boring. So here are a few fabric-minded pumpkin decorating ideas to spice up your fall and Halloween decor! All of these pictures were found on Pinterest. An elegant pumpkin! We have a wide variety of laces right now. So sweet! Of course depending on your style and your stash, your pumpkin may look different. 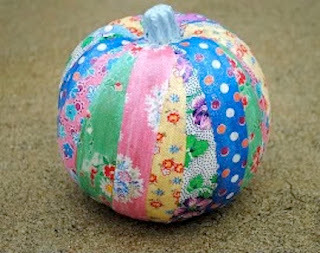 Decoupage strips of fabric to a pumpkin for a patchwork look. Don't like the patchwork look? 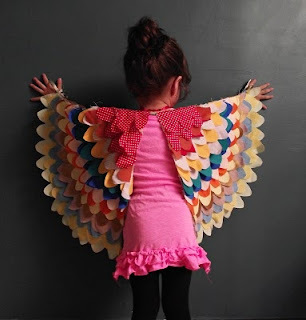 Cut out circles, swirls and more from fabric scraps. Then glue them onto your pumpkin for something a little different. 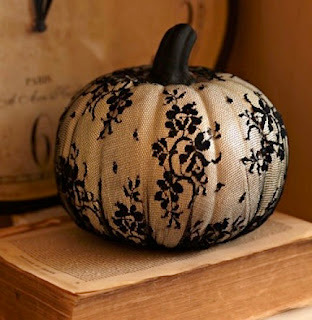 If you have some old Upholstery tacks laying around, stick them into your pumpkin for an edgy look. If you don't have tacks, why not try some buttons! We would love to see how you decorate your pumpkins with sewing-related items. 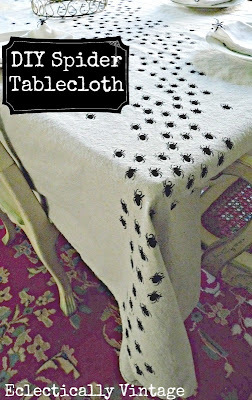 Send your photos to: fabricmartblog@gmail.com. When browsing the web for creativity and inspiration we came across a line of work you don't see everyday. Glamtastik, is a business that we found specializing in designing custom corset dresses for special occasions. 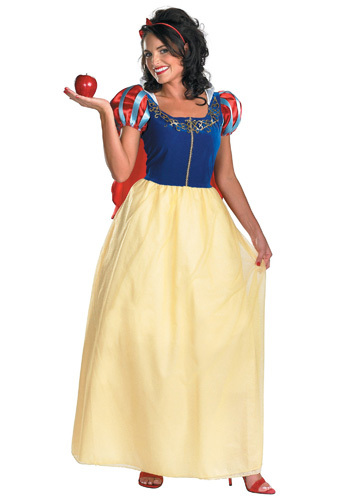 The line up of costumes, dance wear, bridal and prom really sparked our interest. Angela Pilat, is the owner/designer of Glamtastik. Angela Pilat has been creating custom corset dresses as well as being a professional photographer for over ten years. Not to mention being a professional model and make up artist as well. With all of her creativity, she not only does a lot but she does it admirably. Two very accomplished business' while also being a mother and wife. We were motivated to ask a few more questions to get to know more about Glamtastik, so read on and enjoy getting to know about this thriving business. When did you start and what made you want to design custom corset dresses? I have been a professional photographer for just over ten years now. www.AngelaPilatPhotography.com I thought that I had really found my true passion in life. That was until September of 2009. My boyfriend, at the time, (now my husband) and I went out to Las Vegas to do a Photo Shoot. Since he is also a photographer, he wanted to photograph me at the neon sign graveyard. I needed to come up with an amazing outfit that no one else would have already shot in that amazing location! I searched online and did not find quite what I was looking for, so I decided to make it. 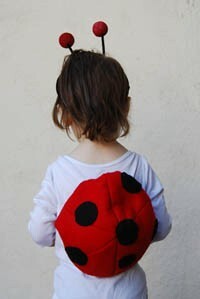 Since I did not have much sewing experience at the time, I consulted my mom. She has sewn her whole life. If she could not help me achieve my "Las Vegas look" I am not sure who could! After our photo shoot, I posted the images on facebook. Everyone loved the images and the outfits we created. I was told from a few people to open up an Etsy page. I did and everything sold pretty much right away due to the Halloween season. I felt like I was on fire! Not only did I love my new career, but everyone else seemed to as well. What inspires you at Glamtastik, from day to day? I get inspired by music videos, fashion shows and other designers. Sometimes new fabrics and trims give me inspiration, too. What are some of the main fabric types and/or materials you use when sewing for Glamtastik? My fabric would have to be tulle. We use it in just about every design. It is a Glamtastik staple for sure! I also love feathers. What is one of your favorite dresses you have created? Picking out a favorite dress is not an easy thing to do. I have created well over 300 designs within the past few years. The more I sew, the better I get. I am no longer afraid to try new things. I recently made a dress that has a huge train that is about 10 feet long and 7 feet wide. It has tons of cut up tulle that had to be individually tacked on. It took forever, but I am super happy with the results. Currently we are working on Halloween costumes. We have a ton of orders that have to be made and shipped out by the end of October. We are making lots of witch costumes, Katy Perry costumes, and Burlesque costumes. I plan to still make a peacock dress very soon with huge wings. I am looking forward to finding time to work on that, as well as more zombie costumes and a Morticia style dress. We have been sharing sewing rooms on our Facebook, can we get a peak of your sewing room? 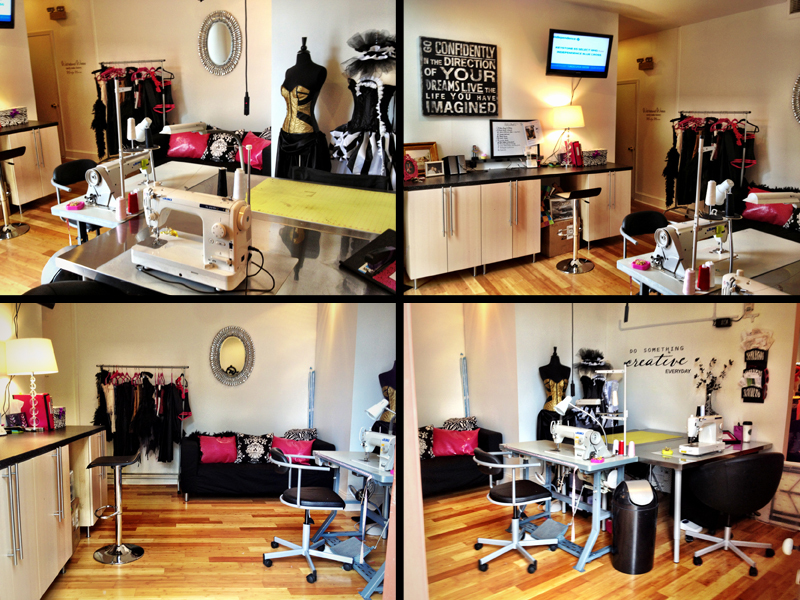 My sewing space has three sewing stations. There is a long counter that is used for making accessories and such. I have both a tv and a couch. I tried to make the space as cozy as possible since I spend most of my time there. What are all the services Glamtastik offers? We make Halloween costumes, prom dresses, alternative wedding dresses, mini top hats, fascinators, capes, and feather collared neck pieces. We also offer photography services. For a session fee, clients can come in and wear my designs in a photo shoot. My store transforms into a photo studio! 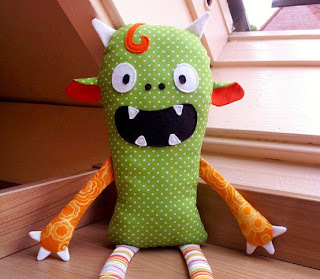 Any advice for others in the sewing industry trying to get their business started & be successful? I have tons of advice for anyone getting started... business does not come knocking on the door, unless you work hard for it. It took me years to get any sort of recognition. Never give up. Market yourself through social media. It is free and you can target who would be your potential clients will be. You really need to have a clear understanding about Etsy, if that is where you want to sell online. I highly recommend starting there. I have tried to Ebay in the past and have not had good results. The main thing to remember about selling online is to have good photographs. Without them, you will not sell anything. Your clients need to see the quality and detail of your work. If you are not a photographer, hire one. Or get a camera and shoot your pieces outdoors. Get away from artificial lighting! Shooting indoors and not knowing what you are doing will lead to some pretty awful photos. Another option would be to buy studio lighting and have a photographer show you how to set everything up. If you plan to sell a ton of things and make it really work, it is a good investment. You just put a ton of time and effort into making the piece, why try to cut corners and take crummy cell phone pictures? You want to also remember what you made when it sells. You will also be able to use the pictures for your portfolio. You have an official store front now! Tell me about that. Where is it and how is that different than selling your designs on Etsy? I love having the store. Mainly due to the amount of space I now have. Coming from a 10'x12' spare bedroom that was my workspace, it is a HUGE difference. I used to have to store my dresses in storage containers in the basement. I was also able to hire a seamstress. Her name is Gail and she has been a huge asset to the business. She helps me design and to fill all of my orders. This way, I can do more of what I really want... and that is the designing. Probably about 80% of my business comes from Etsy. I do have a ton of clients who come from all over to see the shop and to try the dresses on. This was not something that I could do before. Your business is booming and getting a lot of attention. Where do you see it going from here? I hope to expand and have the need to hire more employees. I could really use someone to do all of my marketing and social networking. I want to expand the bridal line. I plan to always do this. I love what I do...I truly have the best job in the whole world. I count my lucky stars every single day. I never want it to end. In order to do this, I know that I need to always be creative and have fresh new ideas. I believe that by expanding my line, this will give me that ability. Made the very first Katy Perry costume that was available for retail purchase. The Katy Perry dress was featured on Access Hollywood, and on Extra TV. Angela has been featured on the front page of Etsy in a treasury. During Glamtastik's peak seasons on Etsy, there are consistently, well over 3,500 people in my store on a daily basis. Glamtastik is one of the top sellers on Etsy. Etsy reaches out to Angela to give them advice on how she thinks their website could be improved. Just last month, we had 3 dresses featured on WE tv's, My Fair Wedding with David Tuttera. We really enjoyed learning more about Glamtastik. You should definitely check out her website, this post doesn't even begin to show how many designs she has created and the amount of work she has completed with all her talent.